It strikes me that there’s a certain amount of appreciation for baked goods amongst beauty fans. Cookies, cupcakes, muffins, cake-mix licked straight from the bowl… we’re just not fussy. Perhaps it’s because we’re so finely attuned to appreciating the finer luxuries in life, or maybe we’re just a little big piggy – whatever the reason – I’m pretty sure you’re gonna get as excited as I have about today’s Christmas Gifting pick. ~ A reusable and very practical cookie tin in which we can hide our multiple stashes of Fox’s Crinkle Crunch. Don’t look at me like that. ~ A full-size maple-scented The Breakfast Scrub sugar body smoother. Maple scented… excuse me while I make noises that a doughnut-spying Homer would be proud of hearing. ~ Finally, a squee-cute APRON!!! OMG!!! A Soap & Glory apron! There is nothing about this gift set that I dislike and if Mr. L is reading this… (a.) please can you logon and change our Tesco delivery time to an evening slot and (b.) buy me this, kthanksbai. 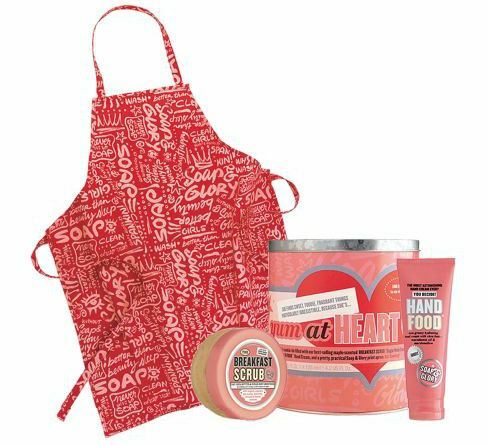 The Soap & Glory Yum at Heart Christmas Gift Set is priced at a very reasonable (imo) £16 and available instore and online at Boots. You should also know that this is included in the current 3for2 offer. Do you suffer from an incurably sweet tooth too? I have a really sweet tooth, which really unleashes itself come Christmas! Cool apron! I have to say I’m not really a fan of S&G (sorry!) as I just cannot stand the scent. I love the packaging though, and I like their makeup!